The Breitling Héritage Superocean Chronographe, one of the newest Superocean Models. 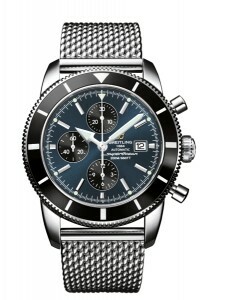 Breitling brings another impressive piece of machinery to the table. The Aeromarine Superocean Héritage Chronographe A1332016/G698 is a stylish, imposing addition to a massive library of professional-grade timepieces. While only slightly less ambitious as a tool than the similar Chrono Superocean, the Héritage Chronograph sports several more aesthetically appealing design aspects at a slightly lower cost, making it an alternative for some who might dive just a little less and want their wrist to look a little better. Not that it isn’t still a fine tool. Luminescent as always and with clear, oversized hands for legibility, the time will be clearly visible to anyone pushing its 200-meter water resistance. Lockable screws provide shock resistance and prevent accidental button-pressing, and double-sided glareproofed crystal casing ensures excellent visibility both in the murky depths and afternoon sunlight. 28,800 vph meets the excellent Breitling standard of smooth hand movement. One of the remarkable things about the Héritage, though, has little to do with the functionality. With 4 available cases, at least 3 watch faces, and a whopping thirteen different strap choices, aesthetics are very customizable for this timepiece, and they all look fantastic. Some fun can be had on the manufacturer’s site, mixing and matching various pieces. My personal favorite so far is a steel strap, black casing, and “gun blue” dials, which have the main watch face as a dark blue and black for the chronograph faces. 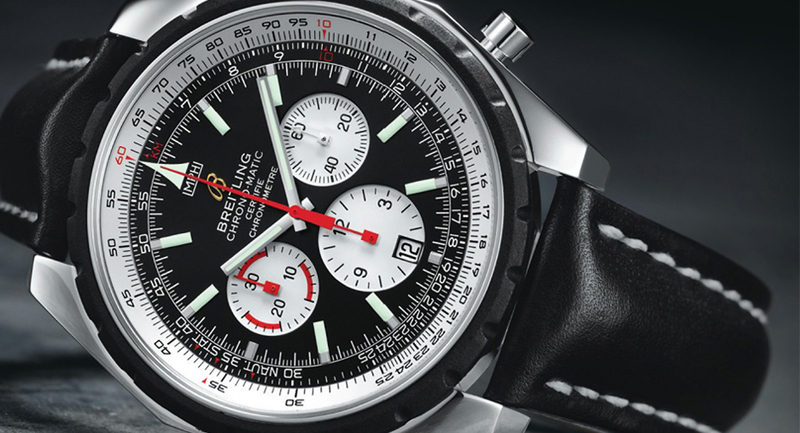 The chronograph itself is as excellent-looking as one would expect from a Breitling. Three dials for seconds, minutes, and hours are slightly recessed into the main watch face, these of course all illuminated in dark lighting. The hours for the chronograph measure up to 12, so any reasonable duration can be recorded with this watch. Official Chronometer certification guarantees a high level of precision from this function as well. As I’ve noted with a similar Breitling product, this watch is big. An impressive 46-millimeter diameter and 16.4 millimeter thickness makes it a large and imposing statement. For casual wear, it may be a bit much, but that is always dependent on the person wearing it and the setting they decide to wear it in. The Héritage, like most Breitling gear, is a fine piece of machinery. Smooth, strong, durable, and conspicuous, it will provide strong use for years and look good doing it.